A few things had not go as planned recently. So when it came time to book flights for Townsville, which I left a bit too late, prices were pretty extreme and organising a rental car was all but impossible. That said, not going was never an option. I’d never leave customers in the lurch like that. The only other option I had left was to drive the 2000km’s up the Townsville. It’s not exactly how I’d planned out my travels at the start of the year, but I ran with it. 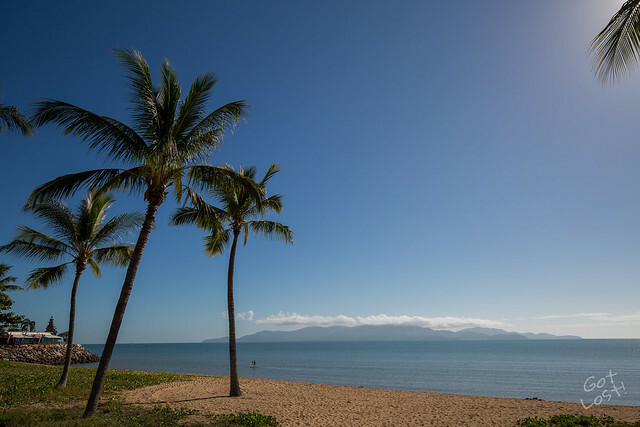 The plan was to drive from just north of Sydney to Roma, Queensland on the first day and then complete the trip to Townsville on the second day. Divide the trip up into two 1000-ish kilometre days. Hey, the Supercars drivers knock over the Bathurst 1000 in a couple of hours. However, when it came to the drive up the inland round, it turned out to be a much easier, although very remote, drive than I expected. By the time I got to Roma, it was only mid-afternoon (I’d left home at 3am), so I decided to kick on to the next town. As it turned out the next town was Emerald, another 4 hours drive up the road. But on the bright side I managed to set a new PB for a single day’s driving, notching up just over 1400 kilometres to get there. Needless to say I was over driving by the time I got to Emerald. But the drive turned out to be pretty easy. The biggest issue I had was finding 4G internet access to keep on top of my work on the drive up. I’m pretty fortunate I can do most of my work where ever I happen to be, as long as I’ve got an internet connection. But I didn’t realise how few towns I would find on the drive up. Since I smashed out such a big drive, the second day was much easier. Only 600km’s I got a bit of work done early in the morning, then drove to Charters Towers for lunch and more work. I arrived in Townsville mid afternoon, which worked out quite well. I got a couple of hours to recover from the drive in the warmth of the Townsville sun before a full on weekend at the track. The weekend at the track was very successful. Busy, but successful. Not just for me, happy to report that a several of my customers were on the podium across the different class racing up across the weekend. But you can read all about that over at InSyde Media. I did try to give myself the day off in Townsville on the Monday after the race meeting to go for an explore and to relax a bit. However, with weekend being as busy as it was I had a tonne of work to catch up on, so taking the day off didn’t work out. I didn’t even get my camera out of the bag to take any travel photos, like I normally do. So here’s a shot from last years trip. The drive home wasn’t nearly as easy as the drive up. Due to the limited internet access on the drive up, I decided to take the coastal route on the way home. While it only added extra 250km’s it was a whole extra day on the road. The road works on the Bruce Highway and Pacific Highway really slowed things down as well. I didn’t even stop to take in the sights along the way. In comparison to the trip up, the drive back was a real slog to get through. But successful race weekend, was exactly what I needed to get my business back on track. So it made the whole experience worth it. Even the lengthy drive. That said, I’m not very keen on the doing that particular drive again. Particularly the coastal route. So I’ll have to put the hard yards in and make sure I’ve the business in a better position next year. Next time, I’ll make sure I get some more proper travel photos, so make sure you follow my personal Twitter and Instagram accounts. I’d you’d like to see more of my professional work, head on over to InSyde Media as well as on Facebook, Twitter and Instagram.